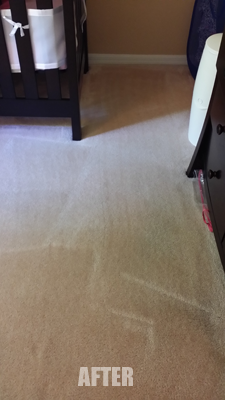 This Tampa FL home owner had tough carpet stains in their nursery. Being in the babies room you can never be too sure what has been deposited in the carpet. Stains that have been left to sit without cleaning can set into to the carpet making them difficult to remove. It’s always important to clean up carpet accidents as soon as possible. The longer you wait the tougher it will be to remove. This Tampa FL homeowner was not sure how or when the stain originated it but they wanted it gone. Unidentified stains are always difficult because you need to have the right stain remover to for the type of stain you are cleaning. Fortunately, with a heavy pre-conditioning spray and some dwell time we were able to successfully lift this stain from their carpet. 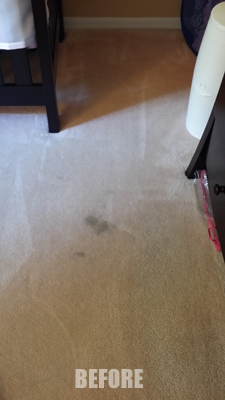 If you have unidentified stains or stains that have set in to your carpet Call Chem-Dry of Tampa FL and we will do our best to remove even the toughest carpet stains. Get Chem-Dry of Tampa to remove your stains.